A new addition to our wedding band set collection. 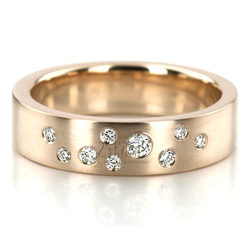 Traditional flat comfort fit wedding band set is enhanced with diamonds. 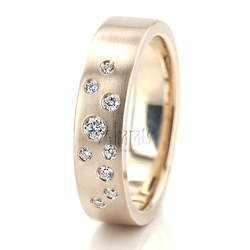 The diamonds that make the milky way design are set with burnish fashion, approx. 0.12 ct. t.w FG VS quality. Total Gram Weight*: 20.7 grams. Diamond size 1: 6 pieces x 1.3mm Round cut with Burnish Set - G/H Color - SI1 Clarity - 0.06 ct.tw. 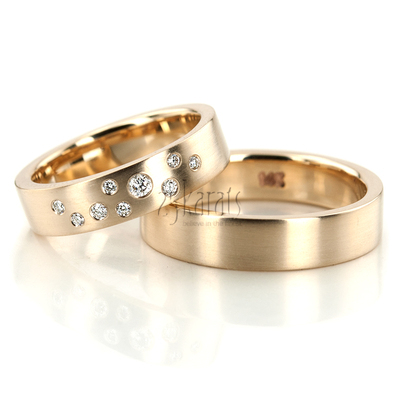 Diamond size 2: 2 pieces x 1.5mm Round cut with Burnish Set - G/H Color - SI1 Clarity - 0.03 ct.tw. Diamond size 3: 1 piece x 2.0mm Round cut with Burnish Set - G/H Color - SI1 Clarity - 0.03 ct.tw. 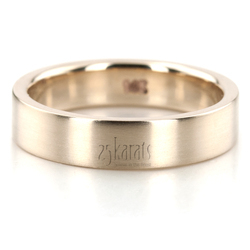 Total Carat Weight: 0.12 ct.